10 Volumes, 42 Issues, 243 Articles available from 2011 to 2019. An International Journal of Marketing that endeavours to spread innovative research ideas across the globe. 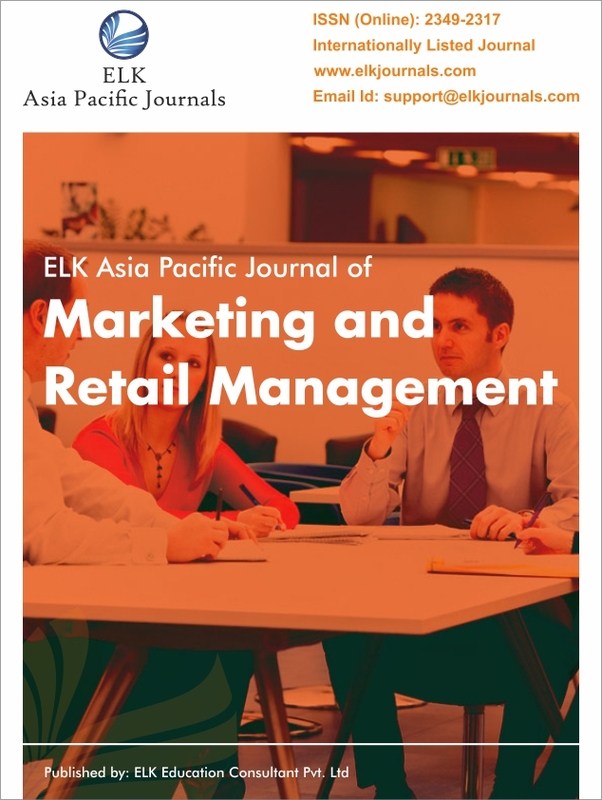 ELK Asia Pacific Journal of Marketing and Retail Management - An open access Indian journal of marketing, is a unique initiative from the ELK group. The main objective behind the launch was to bring on-board an international journal of marketing. With the retail industry taking huge strides and developing to an unprecedented scale, there is requirement as well as scope for research in the field. With the initial focus of making it a prominent Indian journal of marketing, we expanded its reach worldwide by catering to global research. Since inception, it has been successfully disseminating research ideas and prospects. Through this open access marketing journal, we connect with the academic researchers as well as professionals, who conduct studies in the sphere of marketing and retail trade on two levels. On one hand, we invite contributions from the researchers and ask them to send across their research papers for publication to a journal of marketing management. Thus, we support the efforts of the scholars. On the other hand, highly distinguished professionals have team up with us as part of the editorial team. They ensure to follow a strict Double Blind Peer Review process so as to maintain the standards of our impact factor journal of marketing and retail management. They review every paper and add value with their constructive feedback. The worth of papers is enhanced with manifolds by getting published in Indian Journal of Marketing, prominently titled as ELK Asia Pacific Journal of Marketing & Retail Management. This open access UGC approved journal in marketing undergoes peer review by most distinguished editors and subject matter experts which s also listed in the Cabell’s Directory. This makes it an international journal of marketing which reaches hundreds of institutions and professional bodies through online open-access publishing mode. ELK’s open access International Journal of Marketing offers unique benefits for readers, contributors and institutes/ universities. It follows the Double-Blind Refereeing Process for review and acts as an effective medium for promoting marketing education. We encourage both theoretical and empirical research. ELK Group also offers ELK Asia Pacific Journal of Finance and Risk Management. Our scope in terms of material published under impact factor journal of marketing includes Doctoral Dissertation Abstracts, Research Papers, Book Reviews and Case Studies and industry reports. Our official website seeks to make the process of reaching us simpler by facilitating submission of papers throughout the year online.